This disease organism which became widespread in Ohio in 2012 grows under the leaves and on the stems of impatiens which eventually cause severe leaf drop and death of its host plant. What other plants are affected? While other plants can be infected, they seem to tolerate downy mildew and some are even able to thrive despite of it. Only Impatiens walleriana (the impatiens in flats) are infected. New Guinea and Sunpatiens are NOT affected. What are some shade substitutes for Impatiens? Caladiums, Coleus, Salvia (in the bloom stage) Begonia, Torenia, some Vincas, Sunpatiens, New Guinea Impatiens, the new Sun Harmony New Guinea Impatiens, Calliope Geraniums and Browallia. Aren’t some of these substitutes more expensive than using flats of Impatiens? They are, as many have to be grown from cuttings instead of seed like the impatiens in flats; however, some of the substitutes like wax begonia and torenia are in the inexpensive flats and the other substitutes like Calliope geraniums and Sun Harmony Impatiens can be planted much farther apart so that you plant roughly one-fourth (¼) the number of plants you would normally have planted and with less labor. What if I plant Impatiens in pots, will they be affected? Probably, as the downy mildew spores are spread not only by splashing water but spread over long distances by wind. So if I still want to plant impatiens from flats, what do I need to do? 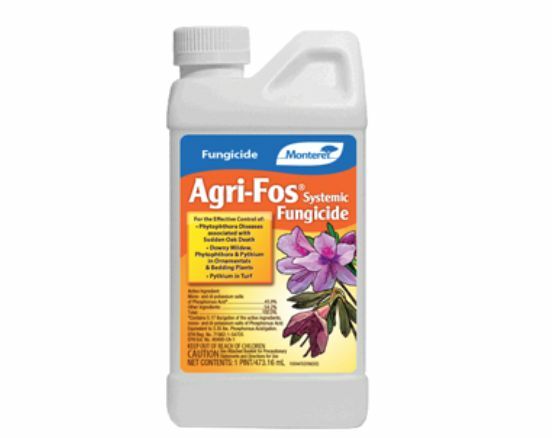 We have a product called Agri-fos that is a systemic fungicide effective in controlling the disease on impatiens. Apply it as a spray to the foliage and stems at the following rate: 1 fluid ounce (or 2 tablespoons) per 1 gallon of water. Apply it to the plants with a pump sprayer or an Ortho Dial-n-Spray. If you use the Ortho Dial-n-Spray, just dial it to the 1 fluid ounce per gallon rate and spray accordingly. If you have a smaller area than 100 square feet, it is best to use a pump sprayer. Just reduce the amount of water and product proportionally. Do read the product label! Note: You must spray the plants the same day you plant them and repeat the treatment every 14-21 days. Thorough coverage of the leaves and stems is essential. Downy mildew must be prevented as once the plants get the disease it’s too late to treat them. One gallon of solution will cover 100 square feet on young plants. Do not apply more spray solution than 1 gallon per 100 ft². Is Agri-fos very toxic to me, my family, pets and pollinators? No, it is just a form of phosphorus acid and is relatively safe compared to other fungicides. Just wear rubber gloves as with any chemical when you apply it. After the foliage is dry from the spray, Agri-fos is harmless.